Herblore can be quite an interesting skill, allowing you to brew your own potions and mixtures by combining the correct ingredients together. Each potion has a unique effect when you drink or use it, such as curing poison, raising your Defence, or adding poison to a dagger. Of course, this is a Members-Only skill, and you need to complete the Druidic Ritual Quest before you can begin making potions. Generally, a potion is made up of three separate ingredients: a specific type of herb, a secondary ingredient, and a water-filled vial. Farming - At level 9, you can begin growing herbs in your own Farming Patch. Monster and NPC Drops - Herbs can be dropped by many of the monsters and NPCs you'll come across in RuneScape. Men, Women, Druids, Skeletons, and Giants are just a few that can drop herbs. Trading Other Players - Of course, you can also buy herbs from other players in the game. When you grow your own herbs, or pick them up from monster loot, they will be labeled as a "Grimy" herb. Before being able to use it in a potion you'll need to clean it by right-clicking on the herb and selecting the "Clean" option. See the Herb section below for more information. Crafting - Vials can be crafted using the glassblowing technique. Bought From Stores - There are herblore shops in Taverley, Shilo Village, Mort'ton and East Ardougne where you can buy empty vials. Monster Drops - Some monsters such as Water Elementals drop vials. Trading Other Players - Vials can be bought from other players in the game as well. The Herblore Help guide contains the best methods of obtaining vials in the Obtaining Vials section. Potions are created in three main steps. First, you need to fill an empty vial with water. Some potions require another type of liquid such as Coconut Milk, but it depends on the potion. Next, add your cleaned herb to the water-filled vial. You'll now have an unfinished potion (unf). Lastly, add the required secondary ingredient to the unfinished potion to complete it. There you have it, a freshly-made potion, ready for drinking! Certain potions require an ingredient such as a dragon scale, which must first be ground up into powder before being used in a potion. 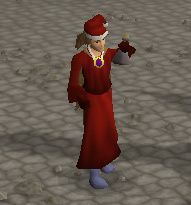 To grind an ingredient up, use a Pestle and Mortar (available at any Herblore shop) with the item. See the Other Ingredients section for more information on secondary ingredients. Most potions you make will have 3 doses, which means that you can drink it 3 times before it's completely used up, with exception to Weapon Poison, which only has 1 dose. You can combine your used potions together to make one up to 4-doses, as long as they're the same type of potion. You can also choose the "Empty Potion" option to completely empty the vial to make room for another potion. These drinks will give your Herblore a quick "level-up" when you drink them, which can be helpful if you're just a level away from mixing a potion. You can buy them from the bar in Yanille, just west of the Magic Guild for 10gp. Any herbs grown using your Farming skill, or picked up as loot from an enemy, must be cleaned before being used in a potion. When picked up, it will be called a "Grimy" herb. By right-clicking on it in your inventory and selecting the "Clean" option, your character will clean it up and make it usable in a potion. Jungle Potion Herbs - These are found on Karamja during the Jungle Potion Quest and include Ardrigal, Sito Foil, Volencia Moss, Rogues Purse and Snakeweed. Agility Arena - Snapdragon and Toadflax can both be exchanged for tickets in the Agility Arena. If you need your herbs cleaned for you, head to the city of Nardah and speak with Zahur. He will clean all of your herbs for you! Each potion consists of an identified herb, and another ingredient to mix in with it. You need to combine the correct ingredients together to make the potion of your choice, and many of the ingredients can be looted from enemies. Others may require you to venture into the Wilderness to find them. Eye of Newt Bought: Taverley Herblore Shop, Port Sarim Magic Emporium. Unicorn Horn Normal: Unicorns; ground the horn with a Pestle and Mortar. Ashes Dropped By: Demons and Imps; they'll also appear from an extinguished fire. Red Spider's Eggs Respawn: Karamja Volcano and the Varrock Sewers past the giant spider web. Blamish Snail Slime Obtained: Kill a Mort Myre Snail, grind it with a Pestle while carrying a Sample Bottle (bought from the Grand Exchange) with you. Respawn: South of the Lost City of Zanaris bank, Cook's Guild. White Berries Respawn: Level 37-40 Wilderness in the Red Dragon Isle. Be careful of the Red Dragons wandering around! Toad Legs Respawn: The Gnome Stronghold Swamp, southeast of Jatix's Herblore shop in Taverley; remove the legs from the Toads. Snape Grass Respawn: Hobgoblin area just west of the Crafting Guild. Dropped By: Tribesman on Karamja Island. Mort Myre Fungus Respawn: Use your Druid Spell near any log in the Mort Myre Swamp and pick the fungi. Blue Dragon Scale Respawn: In the chamber home to the Blue Dragons in the Taverley Member's Dungeon. Wine of Zamorak Respawn: On the altar in the Temple of Zamorak. You must cast the Telekinetic Grab spell on the wine to get it. Or, just kill all of the Monks of Zamorak, pray at the Chaos Altar and then take the wine. Potato Cactus Respawn: In the Kalphite Lair, in the chamber west of the room leading to the second level of the cave. Jangerberries Respawn: On the island just west of Yanille. You can either use Telekinetic Grab to take them, or bring a rope to swing across the river (requires 30 Agility). Tree Roots Obtained: Chop down a tree (Yew or Magic) and use a spade on the stump to dig out the roots. Note: You must have farmed the tree yourself to get a tree root from it. Cactus Spine Obtained: Farmed by you or another player. Poison Ivy Berries Obtained: Farmed by you or another player. Crushed Bird Nest Obtained: Bird nests sometimes fall out of trees while chopping them down. Just use a Pestle and Mortar with the nest to crush it. Coconut Milk Obtained: Use a Hammer on a Coconut to crack it open. then use the open coconut with an empty Vial to fill it with Coconut Milk. Coconuts can be Farmed or traded from other players. Garlic Obtained: Can be found in a house in Draynor, or in a chest in the Burgh De Rott Inn. Silver Dust Obtained: Made by crushing a Silver Bar in the bone grinder in Port Phasmatys. Nightshade Obtained: During the Watchtower Quest. Grown: From the Farming skill. Gorak Claw Obtained: Sometimes dropped by Goraks. Kebbit Teeth Dust Obtained: Catch a Sabre-toothed Kebbit with your Hunter skill and use a Pestle and Mortar with it's teeth. Starflower Obtained: Obtained during the Cure a Queen Quest. Goat Horn Dust Obtained: Use a Pestle and Mortar on a Goat's Horn. Goats can be found in the desert, north of Sophanem, near the Kalphite entrance, to the west and north of Nardah, and near Uzer. Frog Spawn Can be fished from water inside a cave with a Small fishing Net (requires 33 Fishing, gives 75 exp) and possible reward from looting a Gourmet Impling. Rubium Obtained from mining the wall in the second room in Kennith's Concerns. Cockatrice Egg A drop from Cockatrice. Nail Beast Nails Dropped by Nail Beasts located in the Temple Trekking Activity. Morchella Mushroom Can be farmed at level 91 Farming. Now that you've got all your identified herbs and the required ingredients to go with them, you're about ready to make your own potions! Waking Sleep 5 168 Guam, Marrentil, Ground Suqah Tooth, special Lunar Vial. Used during the Lunar Diplomacy Quest. Red Spider's Eggs Restores lowered stats to base level, excluding hits & Prayer. Guthix Balance 22 - Harralander, Red Spider Eggs, Garlic, Silver Dust. You can add garlic and silver to a stat restore potion to make this. Used to finish off Vampyres. Blamish Oil 25 80 Harralander & Blamish Snail Slime Use this mixture on a Fishing Rod to make an Oily Fishing Rod. Combat 36 84 Harralander & Ground Goat's Horn 3-12 levels added to Strength and Attack. Prayer 38 87.5 Ranarr Weed & Snape Grass Restores 70-310 Prayer Points. Crafting 42 95 Clean Wergali & Frog Spawn Boosts Crafting by 3. Bravery 45 0 Snake Weed & Ardrigal Enables drinker to explore the cave in the Legend's Quest. Ground Unicorn Horn Cure poison & adds a temporary resistance to poison. Fletching Potion 58 132 Clean Wergali & Wimpy Bird Feather Boosts Fletching by 3. Ground Blue Dragon Scale Poisons 5 Arrows, 1 Dagger or 1 Spear. Red Spider Eggs Restores all lowered stats to base level and 40% prayer. Extra-Strong AntiPoison 68 155 Toadflax, Coconut Milk & Yew Roots Cures poison and provides a longer immunity to it. Extra-Strong Weapon Poison 73 170 Cactus Spine, Red Spider Eggs & Coconut Milk Use with an arrows, dagger or spear to poison it. Zamorak 78 175 Torstol & Jangerberries Lowers hits & Defence by 10%; increases Strength by 10% and Attack by 20%. Super-Strong Anti-Poison 79 180 Irit Leaf, Magic Tree Roots & Coconut Milk Cures poison and provides a very long immunity to it. Saradomin's Brew 81 180 Toadflax & Crushed Birdnest Increases Defence by 20%, and Life Points by 15%; lowers your Strength, Magic & Ranged by 10%. Super-Strong Weapon Poison 82 186.5 Nightshade, Poison Ivy Berries & Coconut Milk Use with arrows, dagger or spear to poison it. Recover Special Potion 84 200 Super Energy Potion & Papaya Restores 25% of your special attack bar when drunk. Super Antifire Potion 85 210 Anti-firebreath Potion & Phoenix Feather Fully protects you from dragon fire for 6 minutes when drunk. Extreme Attack Potion 88 220 Super Attack Potion & Avantoe Increases your Attack by 5-26 levels when drunk. Extreme Strength Potion 89 230 Super Strength Potion & Dwarf Weed Increases your Strength by 5-26 levels when drunk. Extreme Defence Potion 90 240 Super Defence Potion & Lantadyme Increases your Defence by 5-26 levels when drunk. Extreme Magic Potion 91 250 Magic Potion & Ground Mud Runes Makes all offensive spells 40% more powerful when drunk. Extreme Ranging Potion 92 260 Ranging Potion & 5 Grenwall Spikes Increases your Ranging by 4-23 levels when drunk. Overload Potion 96 1,000 Extreme Attack, Extreme Strength, Extreme Defence, Extreme Magic, Extreme Ranging & Torstol Increases your Attack, Strength and Defence by 5-26 levels, Ranging by 4-23 and makes all offensive spells 40% more powerful when drunk for five minutes. This will also hit you for 500 Life Points over a period of 5 seconds. When the effect wears off, 500 Life Points will be restored and effected stats will return to normal. Prayer Renewal 94 190 Fellstalk and Morchella Mushroom Restores 120-516 Prayer Points over a period of five minutes. Stat Restore potions come in handy when using a special attack that drains one or more of your stats to increase another, like the Dragon Battleaxe attack. To use a weapon poison potion, just use a weapon such as a dagger or stack of arrows with it. To get a Serum 208, simply use a Serum 207 with the fire while the sanctity is at 20% in the Mort'ton Temple. To get full resistance to FireBreath, just drink a dose of Anti-FireBreath Potion while equipping the Anti-Dragon Shield. Sometimes, it can be difficult to gather new herbs when you really need them. There are 2 methods (besides looting monsters and trading other members) which you can use to increase your Herb stock. If you've completed the Eadgar's Ruse Quest (in which you had to get a Goutweed for Sanfew), you can use this method. Head to the Troll Stronghold (of course, you'll probably need some food and equipment!) and make your way to the Storeroom. You'll need the Storeroom Key to get in, which is in the southeast Kitchen Drawer (near Burntmeat the troll). Once you're inside, you'll need to get through the "maze" of boxes to the southern part of the room. Don't let the Troll guard see you! Once you get to the south side of the room near the sleeping troll, search the nearby crate for a Goutweed. Repeat this as many times as you wish. Once you're all set, head over to Sanfew, located upstairs in the Taverley Herblore Shop. He'll trade you as many unidentified herbs as you give him Goutweed. So if you bring him 10, he'll give you 10 unidentified herbs. You will find Salarin the Twisted in the Yanille Agility Dungeon, and he can only be killed with the use of Strike magic spells. Each time you kill him, there's a chance that he will drop a Sinister Key, used to open the sinister Chest in the Skeleton room. Once you have a Sinister Key, leave the dungeon and head to the old (practically dilapidated) house found north of Yanille. You'll need a knife or other sharp object to slice through the web, and you'll probably want an anti-poison potion as well.